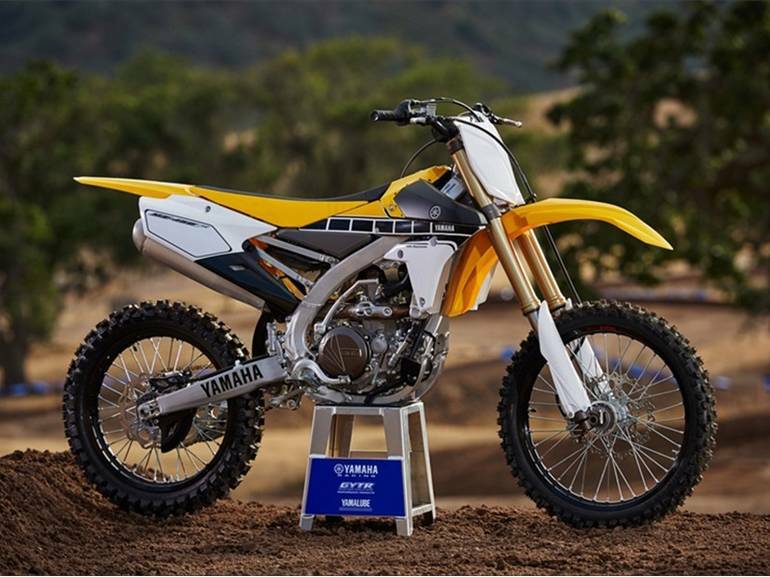 2016 Yamaha YZ450F 60th Anniversary, 2016 Yamaha YZ450F 60th Anniversary Multi Moto Shootout Winner Bike of choice for Justin Barcia and Weston Peick and top pick of the top moto magazines makes the YZ450F a double winner. And the YZ450F is even better in 2016. Features May Include: New Launch Control System New LCS optimizes engine output for quicker, smoother race starts every time, boosting controllability out of the gate, while updated high-precision shifting components improve shifting feel, especially under race conditions. 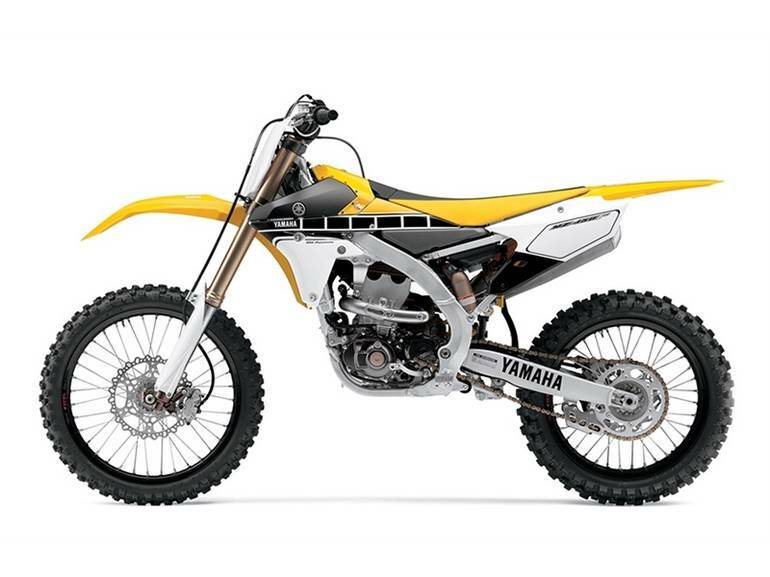 Innovative Engine Design YZ450F s revolutionary rearward-slanted-cylinder design achieves unmatched mass centralization. Concentrating the motorcycle s key components - engine, fuel tank, exhaust system, and airbox - toward the center of the machine achieves superior, nimble handling of a 250cc machine and provides a straight down-draft intake for unmatched power. Advanced Fuel Injection The engine breathes through a 44mm throttle body fed by a high pressure electric pump to ensure optimum fuel atomization and power for a wide range of riding conditions, instantly adjusting the air/fuel mixture for changing altitude or temperature. New Frame Rigidity Balance The aluminum Bilateral Beam frame features a new forged section at the swingarm pivot and 2mm thicker motor mounts to further improve the rigidity balance for more front-end feel, cornering traction and unmatched lightweight handling. New Suspension Settings Industry-leading, fully adjustable KYB® spring-type fork with speed sensitive damping and KYB® shock feature refinements to damping settings result in superior handling, now with additional fork offset to further refine the YZ450F s legendary combination of bump absorption and controllable agility. New 270mm Front Brake Larger 270mm front disc brake coupled with new pad material offers outstanding machine control and performance, with exceptional stopping power and controllability. GYTR® Power Tuner Ready Accessory GYTR® Power Tuner lets owners adjust air/fuel mixture and ignition timing maps to match engine performance characteristics to the rider and track conditions in a matter of seconds with the push of a few buttons, as well as monitor engine diagnostic codes. All Yamaha pictures are kind of Yamaha HD motorcycles picture was taken, including motor fuel gauge, engine, engine mounts, tires, fuel tank, the car handles, lights and so on, 2016 Yamaha YZ450F 60th Anniversary full-screen viewing,2016 Yamaha Motorcycles today Price: $8,690 .